Two-way radios have a specific range they operate within and anything outside of that will cause your radio to lose signal. A radio antenna booster, or a signal booster of any kind, will help extend your two-way radio range. Radio range can be increased through an extender, repeater or booster. 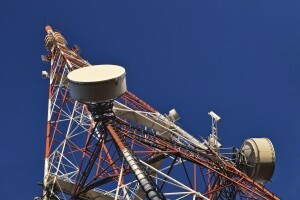 Not only do radio antenna boosters and extenders increase the range you have to communicate, but also they provide clearer voice quality for ease of communication. A radio’s signal strength relies on a number of factors including the radio antenna size, the frequency band, and surrounding landscape, including if you are indoors or outdoors. 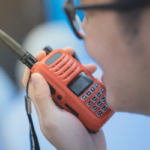 Two-way radio signals travel in a straight line meaning mountains, buildings, trees or even a group of people can get in the way of transmission signals. Simply mounting a two-way radio inside of a vehicle can create interference issues. This is why many go with external antennas mounted to the roof of the vehicle. The higher your radio antenna the less likely it is going to encounter interruptions as it travels from one radio to another. This is why if you stand at the top of a mountain you are going to get the best signal strength, there’s nothing in your way because you are at the highest point. 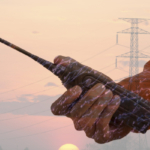 You don’t have to run to the top of the closest hill to restore two-way radio communication. Instead, extending and improving your antenna is often the easiest way to improve radio range. What Does A Radio Repeater Offer? Simply put, a radio repeater takes a poor, weak or ineffective radio signal and amplifies it as well as rebroadcasts it. 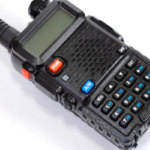 This increases the overall range of your two-way radio. Even with superior conditions most two-way radios only reach so far in distance before a repeater is needed. A repeater system is located at a higher elevation, this device receives and re-transmits signals using a higher power so that it will reach its intended destination. 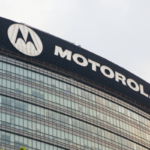 Emergency personal, police departments, commercial businesses and ambulance services all use repeaters to ensure important messages are transmitted and received. If you live in a region surrounded by high mountains or tall buildings a repeater is incredibly useful. Most radio repeaters offer real-time transmission of messages, taking only 50 or so milliseconds to process and resend a signal. ‘Store and forward’ repeaters are another option used to store messages meant for transmission at a later time. An antenna booster is not technically a repeater because it is not using an additional device to rebroadcast anything. An antenna booster is often used alongside radio repeaters to make it easier for the repeater to receive and retransmit original messages. Ditch the complex nature of antenna boosters and repeater stations with a much more simple solution: our Wide Area network, which grants the longest radio range ever. In fact, you can talk from as far as 300 miles apart and still feel like you are right next door to the person on the other end. Highland Wireless maintains an extensive Wide Area network that connects West Palm Beach, Miami, Orlando, Jacksonville, Daytona Beach, St Augustine and Tampa, Florida. We are among the first leading the way for this exciting advancement in radio technology, and are ecstatic to see how far it has already come along. Our Wide Area network works thanks to a series of sites equipped with proper radio infrastructure, all of which connect and work together. This equipment may be located 300 feet up on a tower, or on top of a building. Every site is linked together through an IP network. When a message is input it moves through the stations on its way to its intended recipient in a mater of seconds. Contact Highland Wireless today to learn more about radio range that extends over 300 miles!